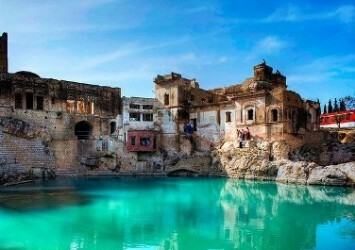 Kot Fateh Khan is one of the very important villages in Fateh Jang tehsil of Attock district. It is noted for containing the historical monuments of both Muslims and Sikhs. The three-domed mosque, believed to have been built by Sardar Fateh Khan during the British period, marks the landscape of the village. Sardar Fateh Khan was a notable chief of the area during the British period. He laid the foundation of the mosque, which gives today the village its identity Apart from the three-domed mosque, the Sikh buildings of the British period also dominate the landscape of Kot Fateh Khan village. Three Sikh buildings, a gurdwara and two Samadhis are located to the west of the village. During the British period, the village was very sacred for the community because of the Samadhi of Baba Than Singh who was known for his righteousness. The Sikh community used to gather in the fair of Baba Than Singh in the month of Baisakh (April-May). According to the Rawalpindi Gazetteer, 4000 people attended the fair in 1893.